Organizers of the concert are working hard to ensure that this premiere concert is one that fans and attendees will be talking about long after the concert is over. As part of this, they are putting together a stellar performance line-up which currently consists of the following artistes: The Mo’Hits Allstars, Choc Boiz (M.I, Jesse Jagz, Ice Prince and Brymo), EME Crew (Banky W, Wizkid, Skales), eLDee ‘the Don’, Tiwa Savage, Lami, Mo’cheddah, SauceKid, Show Dem Camp, Sound Sultan, Timaya,Chidinma, Myke, Iyanya, Eva, RuggedMan, Ikechukwu, Kelly Hansome, Kennis Music, Iceberg Slim, Kefee, Dammy Krane, Yung6ix, Davido and a host of other performers soon to be announced. 2011 at GET Arena, in Lagos, Nigeria. 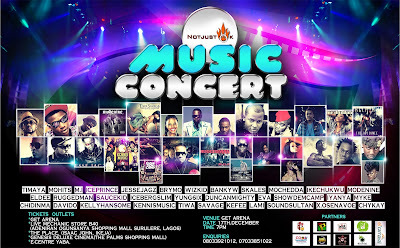 The NotJustOk Music Concert is an opportunity for artists, whose music and work have received loads of support from the site, to connect with the fans who provide that support. By visiting the music site daily to listen, download and/or buy albums, these loyal fans support not only the artist, but the entire Nigerian music industry, which has in the past few years experienced immense growth both at home in Africa, and internationally. For Sponsorship and other Enquiries please call 07033851022 or 08033921012. MTN BIS SUBSCRIPTION IS NOW N3000 .